Marketing is no longer about talking at the customers. It’s about talking with them, and figuring out which content they’re most interested in seeing. To accomplish this, you can look at analytics, such as subscriber numbers on email newsletters, click-through rates, site visits, Facebook likes, and the amount of comments you receive on a blog post. While it’s extremely useful to know where you stand in terms of ROI, it’s also necessary to get direct feedback from your customers to determine if your marketing efforts are working and your objectives are being reached. 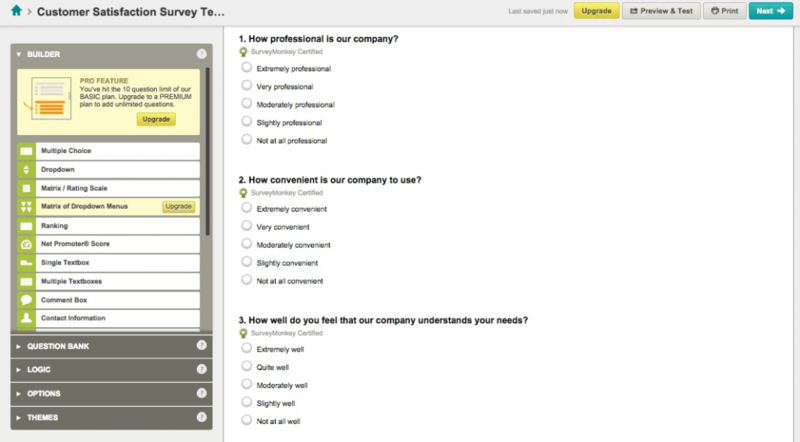 One way to find out your customers’ opinions is by sending out a survey. The following are some tips to keep in mind, as well as some websites that will help you effectively survey your audience. A single, all-encompassing survey for every one of your marketing campaigns isn’t going to cut it. You’re going to need several surveys out there for all your different projects. Before you begin thinking about which questions you’ll ask, you have to know how you’re going to use the answers you’ll obtain. For example, let’s say you want to know where most of your site visitors are coming from. From there, you can then start to formulate the questions. You might ask your visitors how they found your site, what other sites they like to visit, and whether or not they saw you on social media platforms. When generating your surveys, specificity is key . Have a precise goal you want to achieve, and then work from there. You have some customers who follow you primarily on social media, while others only receive your e-newsletters. If your survey isn’t relevant to your customers, they will take one look at it and decide not to fill it out. After you come up with your purpose for the survey and the questions you’re going to ask, you have to post it on the correct platform. Then, you will actually reach the segment of the audience you’re hoping to target. 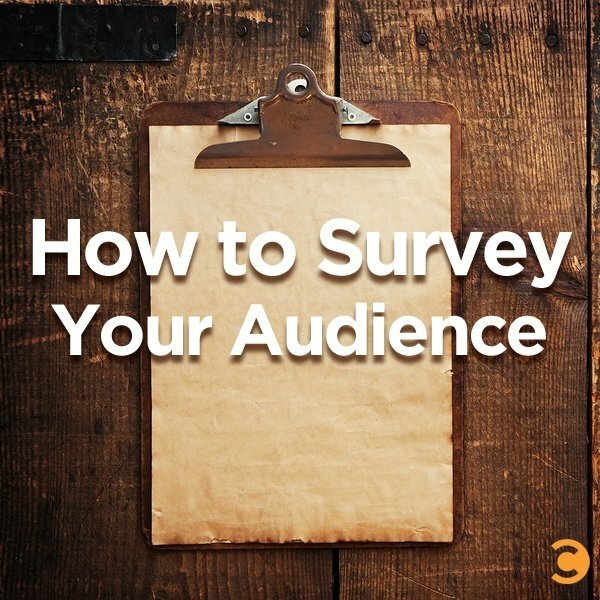 When you post or send the survey, make sure that it’s prominent so that your audience can actually see it. 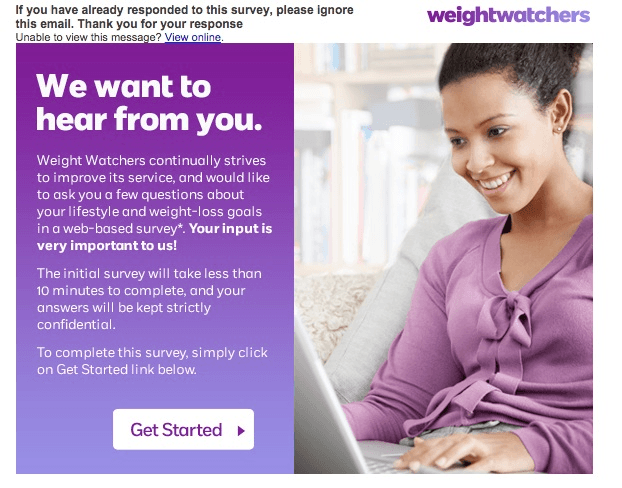 One week, instead of sending out your e-newsletter, email your customers the survey instead, just like Weight Watchers did. If you receive a lot of hits on your Facebook page at a certain time of day or day of the week, post it then. For a limited time, run a pop-up survey before customers check out of your e-commerce store on your website. If you don’t feature your survey and make it a priority, customers won’t either. Your audience doesn’t owe you anything. If they’re filling out your survey, you should be grateful. Therefore, it’s important that you keep it short and write simple, easy-to-answer questions. When blogger Brian Casel asked his followers for feedback, he called it a “60-second” survey. “I know people are donating their time when filling out a survey, so I wanted to respect that,” he wrote. You should have the same attitude when you create your survey. If you go back and answer your own questions, and the whole process takes more than a few minutes, eliminate some and save them for the next time around. Surveys are essential, but you must know how often to send them out. If you ask your audience for feedback too frequently, you risk irritating them and ultimately turning them off your brand. E-newsletters, however, are a different story. When it comes to email marketing, blogger Pam Neely recommends sending surveys out once or twice a year. For text message marketing, keep the same general rule of thumb in mind. Your survey is being delivered into people’s personal email and cell phone inboxes, so you don’t want them to feel as if they’re being hassled. Want to get the answers you need and increase brand loyalty? Provide your customers with discounts or prizes for filling out your survey. At the end of every survey, you could include a coupon code or ask customers to fill in their email addresses to be entered into a raffle. Walmart, for example, gives out $1,000 gift cards to some select participants. Customers always appreciate free things. By offering them prizes and incentives, you’re showing that you value the fact that they took precious time out of their days to give you feedback. Next time, they’ll be more inclined to fill out another survey. Some other tools that companies use are Qualtrics, Google Forms, Doodle, and SurveyPlanet. What are your favorite survey generators? Do you find that surveys help you reach your marketing goals? Tell us about it on our Facebook or Google+ pages.